Medical tools and computer technologies are extending the range of art preservation for future generations through collaborations across museums, galleries and STEM institutions, an interdisciplinary panel said Saturday at the 2019 AAAS Annual Meeting. 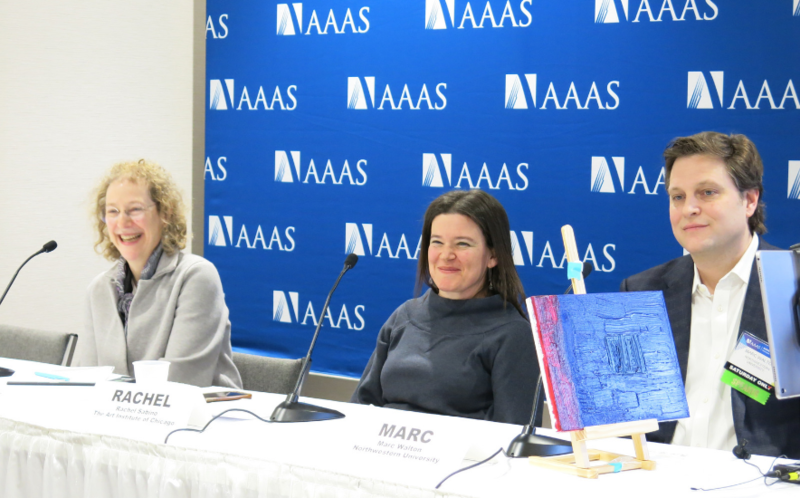 The panel, consisting of a computer scientist, a materials scientist, an engineer and an art conservator, showcased three distinct projects to demonstrate how technology is helping uncover historically significant discoveries and propelling art conservation, during a news briefing. Despite differences between the panelists’ disciplines and the tools they employ, their research has much in common, they said. “What’s striking to me is that the basic tenets, responsibilities and ethics of art conservation are refracted identically through all these projects, though they manifest themselves by different approaches,” said Rachel Sabino, associate conservator of objects at The Art Institute of Chicago, who is leveraging advanced medical visualization instruments to authenticate a group of West African terracotta objects. Art conservators have sought expertise from chemists, materials scientists and woodworkers for centuries. Partnership with experts in technology is another step toward advancing conservation, the panelists said. In 2014, Sabino forged a relationship with the University of Chicago Pritzker School of Medicine for a project involving Egyptian mummies. The collaboration gave her team access CT scanners, more commonly known for use in imaging tissues to diagnose cancer and other tissues. 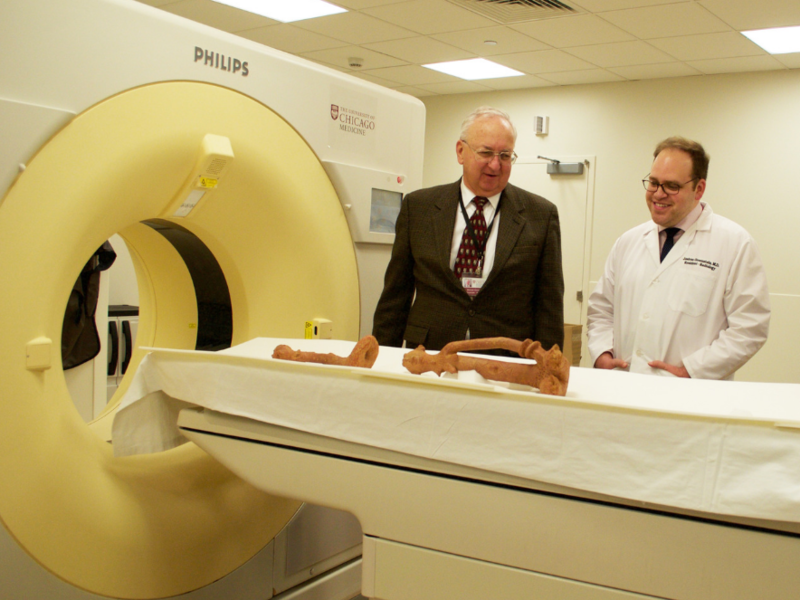 In fact, CT scanners have been used for the study of cultural heritage for some time now, noted Sabino. When she received a group of ceramic figures from West Africa – some of which could be forgeries – Sabino turned to her medical colleagues for help. The partnership allowed her access not only to an otherwise extremely costly tool for an art conservation lab, but also to expert advice on scientific protocol, questions like the correct dose of radiation or how many “slices” per second they needed to scan the objects. The scanners helped distinguish the fake from the real and confirmed that the African sculptures were more ancient and detailed than previously believed. This was especially significant, said Sabino, not only because counterfeit objects had been coursing through the African art market since the late 1980’s, but because “ancient” and “exceptional” art objects are not often seen in Africa. Affirming the authenticity of newly discovered art from the region was an important historical, social and ethical contribution to African culture, she explained. “Objects serve to inspire, and we’re pushing out technology for these works of art,” said co-panelist Marc Walton, who provided the perspective of the scientist in a conservator-scientist collaboration. It presented an opportunity for Walton to test his newest project: a technology that measures the surface shape of paintings at a fine scale. His initial prototype, however, was heavy and bulky. He realized he had to pare down the technology to make it sustainable and simple for anyone from conservators to amateur art collectors to use. Pulling out a small painting and a tablet, Walton publicly demonstrated for the first time the latest prototype of his technology. The app, currently a beta version, took a picture of the painting and mapped fine details – at submillimeter resolution – of the painting’s dimensionality, based on how light reflects off the painting. Using the Georgia O’Keefe museum as a testbed for the technology, Walton hopes his app will streamline data collection on paint disease, so that it will be easier to diagnose, predict, treat and prevent in the future. Like Walton, Deena Engel was called on to step into the conservator’s shoes when the Museum of Modern Art asked the Courant Institute for Mathematical Sciences at New York University for someone who could help conserve one of the newest forms of contemporary art: art made from digital mediums, or time-based media. Just as paintings face damage from chemically-induced protrusions, time-based media face fast-paced changes in operating systems, unavailable hardware and changes in a color palette, said Engel, a clinical professor of computer science. The goal and challenge of such a collaboration was to merge software engineering practices and adhere to the ethics and principles of art conservation, she said. In computer science, if functionality needs are met, scientists often can do what they want with the software, said Engel. But when her team handles a work of art, they must incorporate the artist’s vision and user experiences into their work. This can keep them from updating to the newest color palette or a shinier resolution, for example, said Engel. Conducting interviews with artists to discuss their methods and plan the restorations of their works of art is vital. Now, working with the Guggenheim, she and her team’s work alongside a team of conservators and curators has led to the restoration of two of seminal works at the Guggenheim, called “Brandon” and “Unfolding Object,” said Engel. New restorations are on the way.